I have fond memories of Hater, the first book by David Moody that I ever picked up. I was browsing the bookshelves of a second-hand bookstore with my family, looking over the usual smattering of non-fiction and fiction titles that it had. This bookstore wasn’t particularly well-organised, and as I bent down to look at some coffee-table books, I saw a paperback wedged in between two cookery books. It was reversed, so I could only see the pages and not the cover, and was wedged pretty tightly; vaguely curious, I used some gentle persuasion and managed to extract it and turned it over. As soon as I saw the cover, I knew I had to buy it: a plain, white background had blood-spattered text that proclaimed the title, HATER, while below it a man – presumably one of the titular Haters – snarled and bared his teeth at me. The back-cover blurb only confirmed my initial assessment, describing a tale of vicious, violent and unexplained attacks by ordinary people who suddenly turned into maddened, remorseless killers. Admittedly that seemed like the start of any generic post-apocalyptic or zombie genre tale, but for the fact that anyone could become a Hater at any time, for no reason at all – whatever turned people into these killers wasn’t carried by bites or blood or some kind of virus, it was something far more primal, far more mysterious. I took Hater home with me, and I managed to finish it in a night. I was hooked, and I was deeply impressed by the author’s writing – it was fast-paced, tense, atmospheric and fun as hell. I found the protagonist to be deeply sympathetic – helped, perhaps, by the fact that I had only recently become a first-time father – as he tried to protect his loved ones as society broke down, seemingly at random, and I absolutely loved the concept itself. Usually your average zombie novel will have survivors coalescing together into communities, able to salvage something as long as they stayed hidden and uninfected; but Hater didn’t allow that to happen. Anyone could become a Hater at any time, shattering any attempt at group survival or even a token effort to retain a pre-apocalyptic society. After Hater came Dog Blood and then Them or Us, rounding out the initial trilogy, and I brought those two titles as soon as I could as well. And from there I looked at what else Mr Moody had written, which allowed me to find Infected Books and the Year of the Zombie project; I reviewed several of the short stories published under YotZ, and I have a review of the anthology itself coming up in the near-future. I wondered where the Hater series would go next, and it was often in the back of my mind as I delved into other genres, and then started up my review blog. 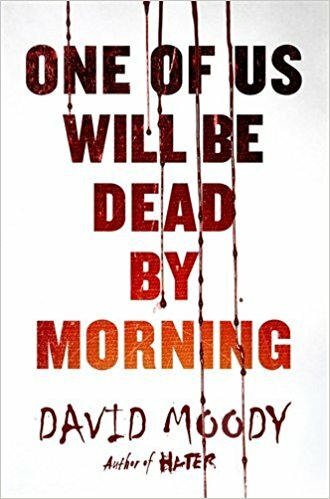 So I was thrilled when I saw that the fourth book in the series – One Of Us Will Be Dead By Morning – was due to be published in December 2017, and even more thrilled to be offered a review copy by Mr Moody in return for a fair and honest review. It went to the top of my reading pile, and I’m happy to report that Dead By Morning might actually be the best in the series, even outdoing Hater itself. Whereas the books in the first trilogy were set in urban and semi-rural locations, with quite large populations, and were also distinctly fast-paced and gory, Dead By Morning takes an entirely different approach. Cleverly, Moody has instead centered the entire novel (save a chapter at the end) on the lonely, isolated island of Skek, situated off the coast of the United Kingdom. Taking place concurrently with the events of Hater, the novel follows a small group of office workers who have been brought to the tiny island for one of those mythical ‘team-building’ weekends that are supposed to bring colleagues together and therefore make them work more efficiently and effectively. As the weekend comes to a close and the team look forward to leaving the island, things slowly but surely start to go wrong: someone breaks their neck falling from a steep cliff, another co-worker the only witness, who claims the victim tried to attack them. Then the ferry that services the island – the only way to get off Skek – fails to turn up on time; and when it does finally arrive, is the scene of a massacre. As it becomes more and more obvious that something terrible is happening, first on the island and then across the UK, the office workers and island occupants begin to turn on each other as they realise that any one of them could become a vicious killer at any point in time. If I had to pick a single word to describe Dead By Morning then I would undoubtedly have to choose atmospheric. The island of Skek is a fantastic idea for a location, and although it’s fictional, Moody has obviously done his research, because before too long I felt like I was practically living on those few square miles of barren, sea-drenched rock and turf. In fact Skek itself almost becomes a character in of itself, constantly challenging the cast of characters and proving to be deadly if not respected, or if someone’s attention wanders for even a second. The isolation provided by the island, that was supposed to be beneficial for team-building and cohesion, rapidly becomes the complete opposite; when the ferry is no longer an option and all seem trapped on Skek, the bleak, barren landscape and sense of isolation are used to wonderful effect by the author to slowly but surely ramp up the remoteness, paranoia and then out-right terror that soon permeates the cast. As the bodies start to pile up, and it dawns on the survivors that something major has happened on the mainland that will likely affect them as well, they soon begin to turn on each other, forming factions and ever-shifting patterns of allegiance that eventually turn to outright violence, especially when some begin to turn into Haters themselves. While each individual character may not be particularly three-dimensional, they don’t need to be; the point of the novel is how a group can fracture apart once enough pressure is exerted, and here Moody excels in showing how a group of co-workers spark off of each other. After all, how well do we really know the people we work with, their quirks and annoyances? Things that are bearable in an office environment, but would become enraging if confronted in an inescapable situation? One Of Us Will Be Dead By Morning is further proof, if any were needed, that David Moody continues to be one of the best writers today in the British horror and zombie genres. He has composed an atmospheric, tense and blood-spattered thriller that bodes well for the rest of the trilogy. I greatly enjoyed it, racing through it in less than two days, and I would recommend that anyone with an interest in horror, zombies or just thoroughly good writing pick it up immediately.